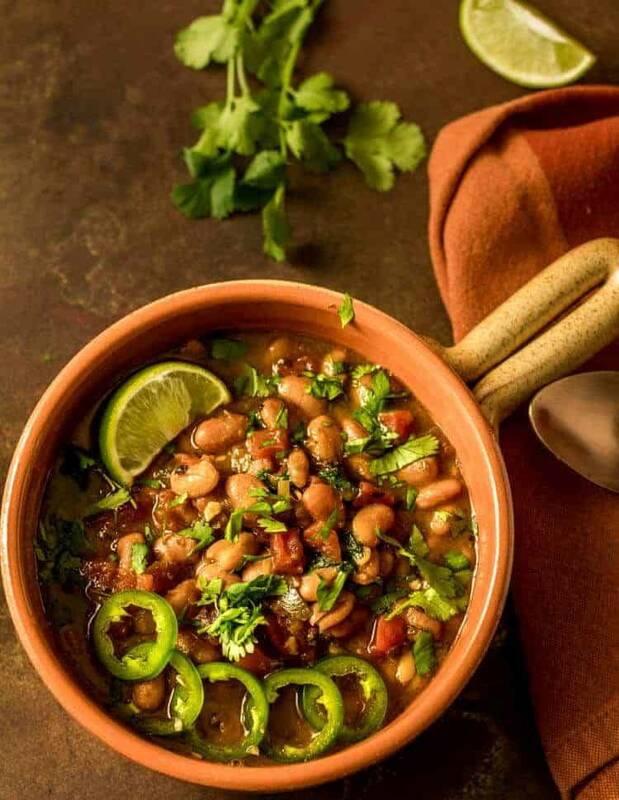 Umami ingredients boost the flavor of my Instant Pot Vegan Borracho Beans, and you won’t miss the bacon (I promise)! Chock full of healthy ingredients, these beans are a great side dish or even a main dish with rice or tortillas. While I am not a “vegetarian,” we do limit meat, and especially fatty cuts like bacon. We only occasionally indulge. 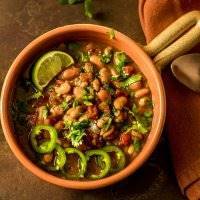 I have made borracho beans with bacon (they’re delicious), but when I decided to create a recipe for the blog, I was committed to coming up with a much healthier version. I have been completely underwhelmed by store bought vegetable broth. It seems “one note” to me. 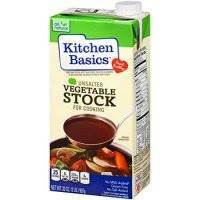 I have found a couple that I liked including Kitchen Basics Vegetable Stock. If you’re feeling motivated, or love all things homemade like I do, you might want to try my Instant Pot Umami Vegetable Broth. My recipe reinforces the umami flavor by including kombu and dried shiitake in the ingredients list. 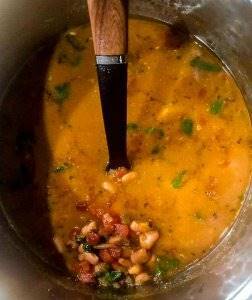 So, good vegan borracho beans start with a good foundation – flavorful broth. Canned beans have their place, but when I’m making a dish that features beans, I prefer to use dried beans. The flavor and texture are so much better! I am not one to do “dump meals” in my IP/pressure cooker… I do love it for making beans, broths and stocks, making short work of tenderizing foods, etc. 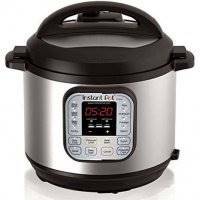 Your Instant Pot saves a lot of time with this recipe – 10 minutes to pressurize, 35 minutes under full pressure, and 10 minutes before releasing pressure. 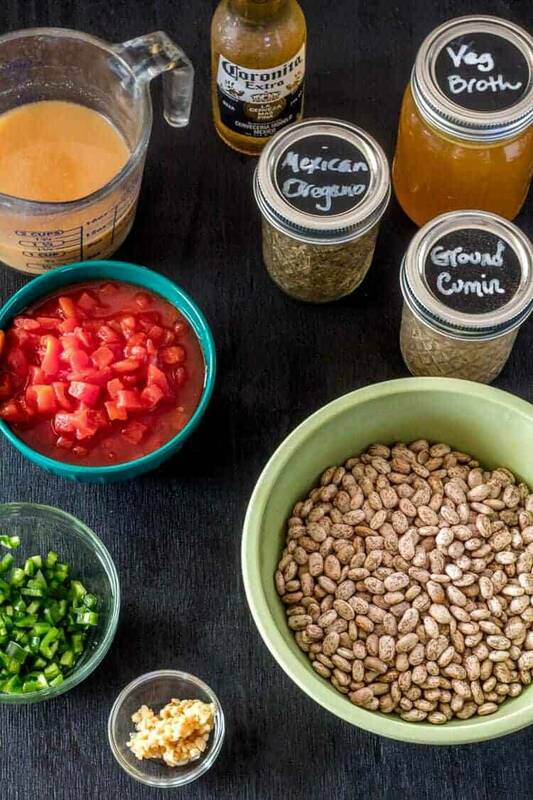 In basically an hour, you can go from dried beans to yummy Instant Pot Vegan Borracho Beans. What are “borracho” beans, and how do they differ from “charro” beans. I hope you’ll laugh… “borracho” is “drunk” in Spanish. Other than a bottle of beer, they’re probably no different than charro beans. No need to worry about the alcohol, it cooks out. Only the beans will be “drunk.” Lol. The “secret” to these flavorful beans lies in the “fifth” taste – umami. As I mentioned above, my vegetable broth recipe includes kombu and dried shiitake (and other mushroom bits). The vegetables are roasted first, and the maillard reaction adds additional umami. The pot of beans includes a generous scoop of miso paste (umami! ), so even if you use store bought vegetable broth, you will get the additional depth of flavor from the miso. While the beans cook, I cut up some fresh garnishes – avocado, cilantro, lime wedges. 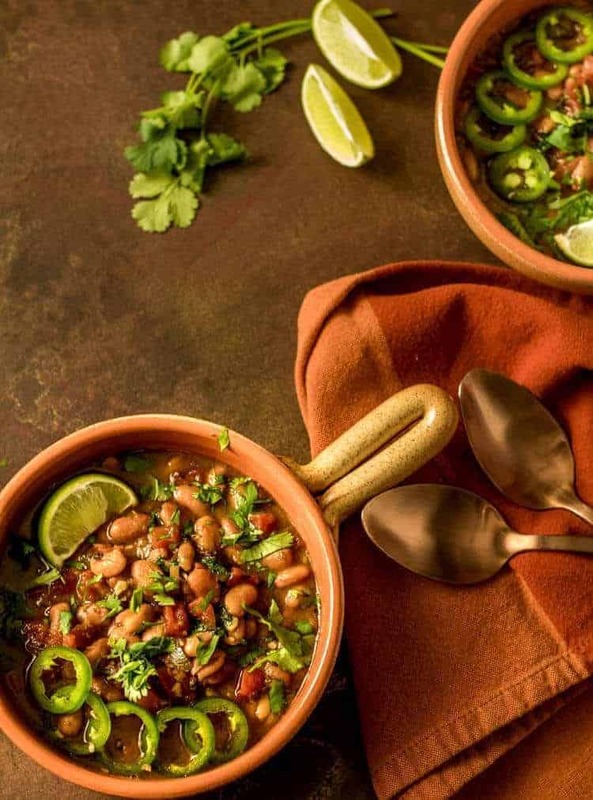 Serve your Instant Pot Vegan Borracho Beans with your favorite Hatch green chile enchiladas, alongside Lengua Tacos With Salsa Verde and Caramelized Onions or for a strictly vegan #meatlessMonday meal, try them with Mexican Cilantro Rice. Don’t forget to pour yourself a cold one! 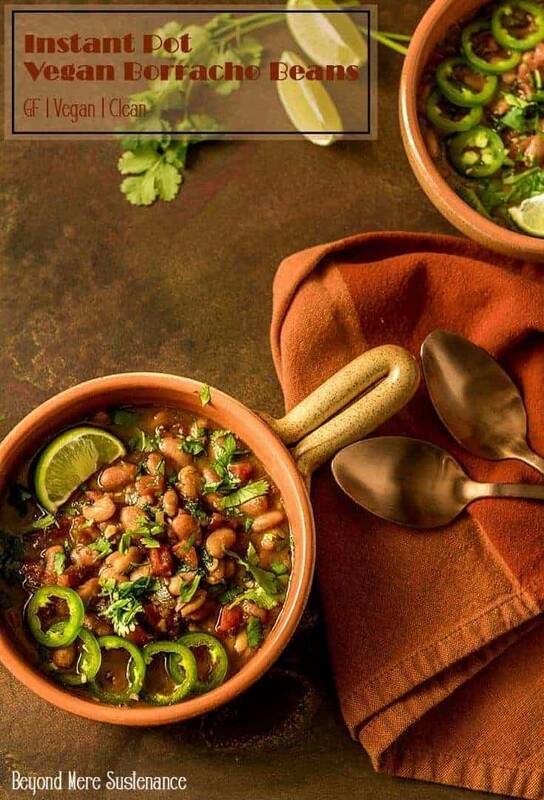 Borracho beans are typically soupy, but if you don’t want all that liquid, use a slotted spoon to serve them. We spoon up every bit of that delicious broth! Borracho beans (drunken beans) without pork fat but with all the flavor of the traditional! To the pot on saute mode, add the oil, onion, garlic, and cumin. Saute until fragrant and onions start to show some color. Add the jalapeños, and cook an additional minute. 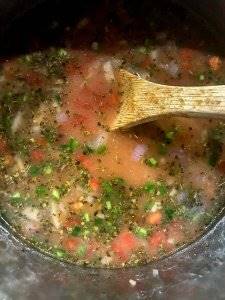 Add the pinto beans and vegetable broth. Whisk the beer and the miso paste together, then add to the pot. Lock the lid, and set to 40 minutes high pressure (I use "beans" setting and adjust the time). When the cycle is complete, wait 10 minutes before releasing pressure. Add sea salt (I start with 1/2 teaspoon), but you may want to taste first. Miso is salty. 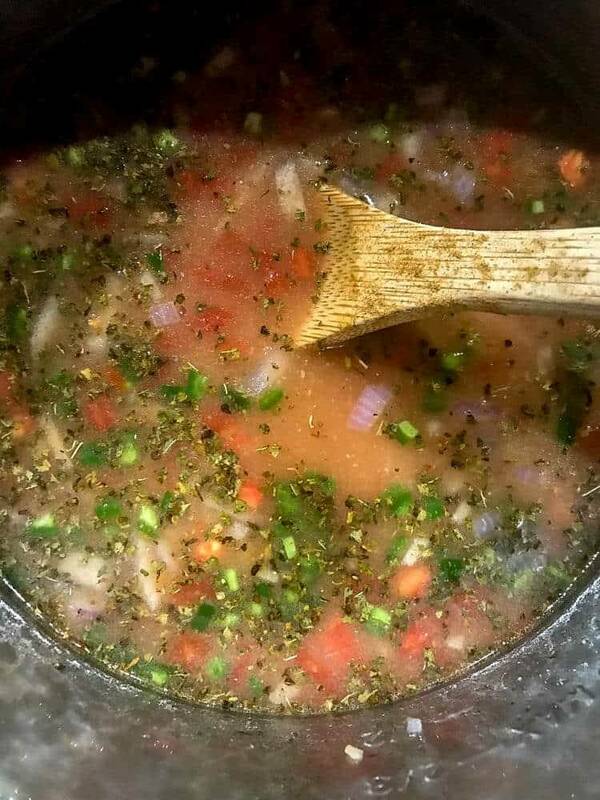 Add fresh ground pepper as desired. Ladle into bowls, and garnish with avocado, jalapeños, cilantro, lime wedges as desired. Enjoy! I don't pre-soak my dried beans if I'm using a pressure cooker. If you prefer to pre-soak, you will want to reduce the time to 20-25 minutes. As I mention in the post, the quality of the vegetable broth is very important in this dish. Use a quality store bought one like Kitchen Basics Vegetable Stock, or homemade. We don't drink Mexican lagers, but they work well in this recipe. I use Corona. Avoid strong flavored (whether hoppy or malty) beers as they will add flavors that may not work well with the other ingredients. I use either shiro (white) or shinshu (yello) miso paste. 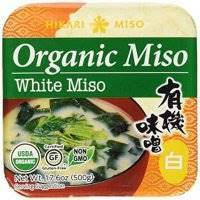 I have not used aka miso (red) as I feel it would be too pungent. For more on miso paste see A Guide to the Different Kinds of Miso Paste. If serving as a main dish, serve with rice for a complete protein. The recipe serves 8 as a side dish. Nutritional information is calculated by Nutritionix and is approximate and for reference only.